Originally described from collections made under live oaks and black oaks in Florida, Lactarius proximellus has since been reported under various oaks as far away as Michigan, Québec, Missouri, and Texas. It is a short, stout little species of Lactarius with a zoned, cinnamon orange cap that rarely exceeds 6 cm in width. Its milk is scanty, and often dries dull green (sometimes only overnight). Similar oak-loving species--including the well known Lactarius psammicola--are larger mushrooms. 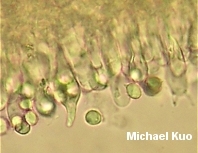 Ecology: Mycorrhizal with oaks; summer and fall (and over winter along the Gulf Coast); apparently fairly widely distributed in eastern North America. Cap: 2-6 cm; broadly convex with an incurved margin when young, becoming shallowly depressed or shallowly vase-shaped; sticky when fresh; bald; finely and innately roughened; with concentric zones of pale and dark orangish cinnamon. 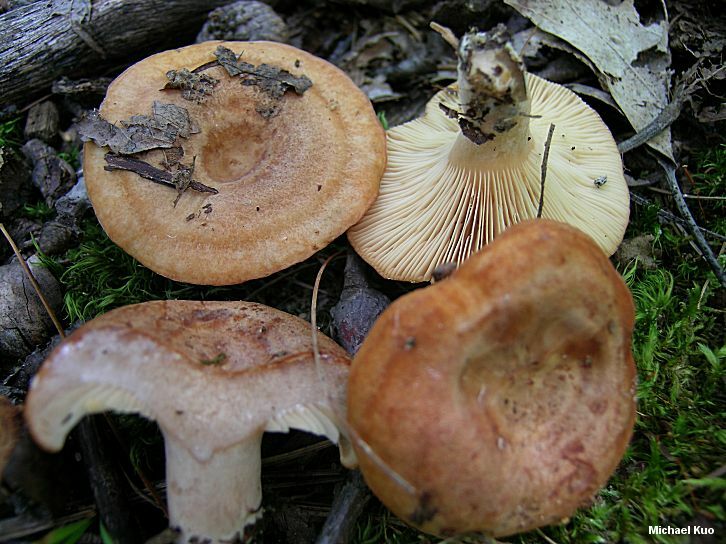 Gills: Broadly attached to the stem or beginning to run down it; close; creamy, becoming orangish to dull cinnamon or brownish; not stained by the milk where damaged. Stem: 1-3 cm long; up to 1.5 cm thick; equal or slightly tapered to the base; becoming hollow; bald; whitish to pale orangish cinnamon; sometimes bruising slowly greenish; without potholes. Flesh: Whitish to pinkish or orangish; not staining when sliced. Milk: White or watery white; scanty; not staining tissues, or staining them slowly dull green (sometimes only overnight); staining white paper yellow overnight. Odor and Taste: Odor fragrant, or not distinctive; taste moderately to strongly acrid. 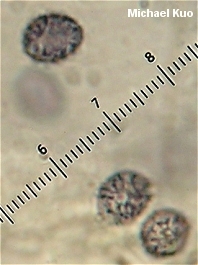 Microscopic Features: Spores 6-9 x 6-7.5 µ; broadly ellipsoid; ornamentation about 0.5 µ high, as amyloid warts and thin ridges occasionally forming partially reticulated areas. 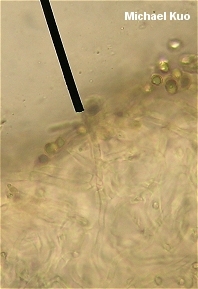 Macropleurocystidia scattered to abundant; inconspicuous; not projecting; fusiform to subcylindric; up to about 60 µ long. Cheilocystidia similar but shorter. Pileipellis an ixolattice of tubular hyphae. REFERENCES: Beardslee & Burlingham, 1940. (Hesler & Smith, 1979; Metzler & Metzler, 1992.) Herb. Kuo 09019514, 09110408.